Home DIY Projects	Elegant Master Bathroom Renovation-Almost There! We started our master bathroom renovation in February. I thought it would take a few months, tops. I had no idea it would take this long! Finally we can see a light at the end of the tunnel! We finally picked out our tile (we changed our minds a few times) and purchased it. Let me say marble tiles are heavy! No wonder it is more expensive to have marble tile installed versus ceramic tile! I bet marble is more difficult to cut also. 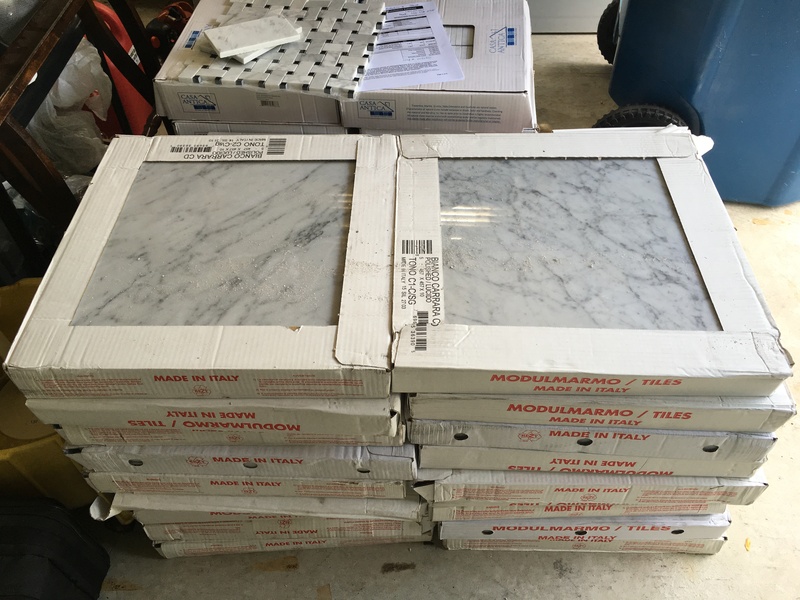 We chose the carrera marble for the floor in the large 18″x18″ size with matching 3″x6″ subway tiles for the shower walls. For the shower floor we chose a sort of herringbone pattern with small squares of black mixed with the carrera marble. These come in 12″x12″ pieces with a mesh backing. The installer is coming in two weeks! Yippee! My husband just finished putting the sheetrock up on the walls this weekend. He installed the hardy board a few weekends ago. Once the tile is complete we will be ready to rock and roll. We’ll be soaking in that tub before we know it! We still need to install the picture frame molding on the walls and paint and add baseboards. To save money I plan to paint the existing cabinets and countertops and replace the sink hardware. If the countertop doesn’t turn out well, I’m afraid we will need to replace it. But it’s certainly worth a try painting it first! In my mind it will look great! So, we hope our elegant master bathroom renovation will be complete in a few short weeks! Keep your fingers crossed!! Hope you have a wonderful weekend!